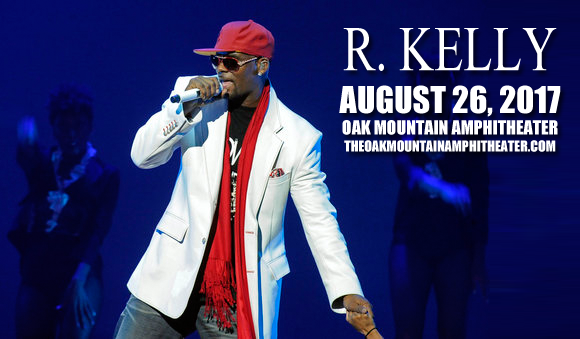 Grammy Award-winning, multi-platinum R&B legend R. Kelly will be bringing the After Party Tour to Oak Mountain Amphitheatre on Saturday 26th August 2017! The "Ignition (Remix)" singer will be dropping solid gold hits from his impressive career as a pop-soul king, so get ready to get down! Best known for his hits "I Believe I Can Fly", "Ignition (Remix)", "If I Could Turn Back the Hands of Time" and the hip-hopera “Trapped in the Closet”, singer, songwriter, record producer, and former professional basketball player R. Kelly is one of the best-selling music artists in the United States with 40 million albums sold. Named the most successful R&B artist of the last 25 years by Billboard, R. Kelly has won numerous awards throughout his career, including a Guinness World Record and countless others including Grammy, BET, Soul Train, Billboard, NAACP and American Music Awards.